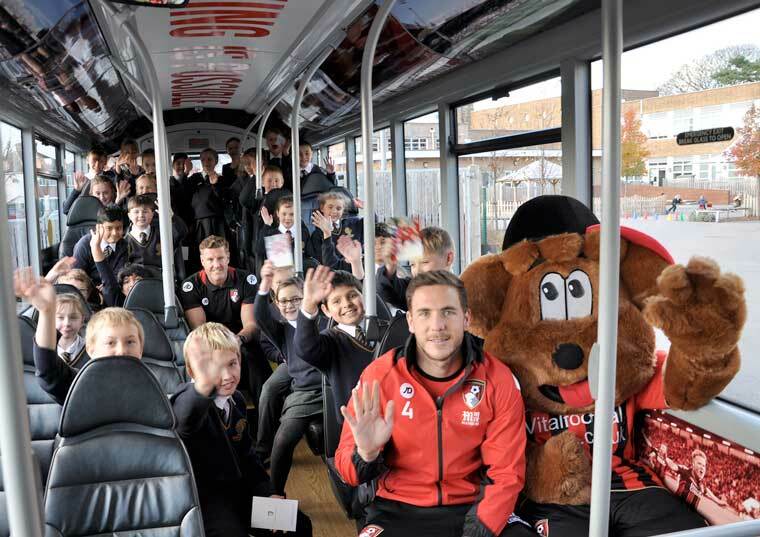 The player ambassador for the Cherries Community Sport Trust’s ‘Soccer Safety School’, that is driving safety lessons into classrooms, arrived on the Cherries-themed Yellow Bus. Club mascot Cherry Bear was also there and the children were thrilled to have VIP guests at their school. Three Year 5 classes at King’s Park Academy met Dan Gosling and club legend Steve Fletcher and took part in a safety quiz with a chance to win tickets for a game. Steve Cuss, the club’s Head of Community, has developed the programme that is proving a hit across the conurbation. He said: “Together with Yellow Buses we have been bringing fun safety lessons to schools – and we are still looking for new schools to join. The Safety Soccer School highlights the risks and dangers that children face when out playing. Midfielder Dan Gosling said: “It was great to meet all the children, especially as the school is the nearest one to our ground. Lauren Dean, Associate Principal of King’s Park Academy, said: “A fantastic afternoon was had by our Year 5 children when Yellow Buses and AFCB visited for a soccer safety session.